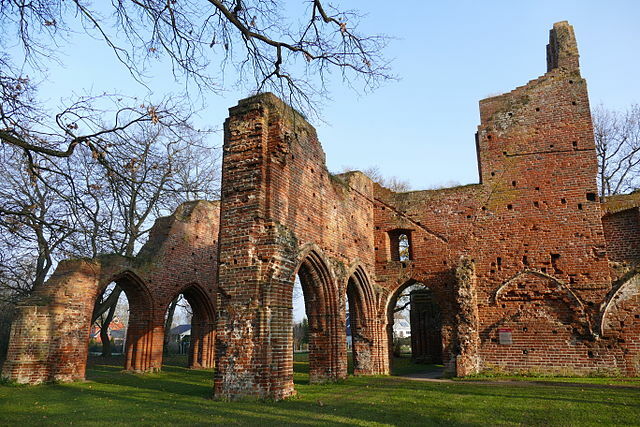 The ruins of Eldena Abbey are located on the outskirts of the city of Greifswald (actually in the Greifswald district of Eldena) in the state of Mecklenburg-Vorpommern (Mecklenburg-West Pomerania) in the northeastern parts of Germany. The impressive remains of the former Cistercian monastery complex are an important monument of the Romantic era and without a doubt of a shadow one of the most famous ruins in Germany. The Brick Gothic Abbey was immortalised by the 19th-century German Romantic painter Caspar David Friedrich. His paintings have made the ruins known worldwide and literally turned them into a symbol of Romanticism. Even though since long time ago in a ruinous state the abbey still radiates with divine beauty and it provides excellent journeys to the long lost past. 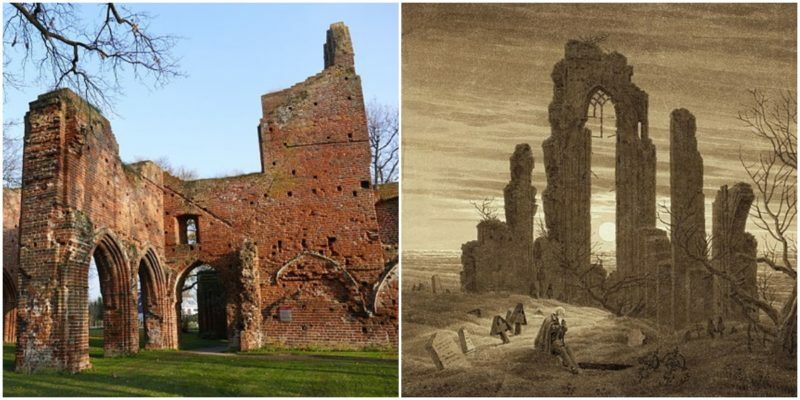 Like many others who visited the site and are still visiting it, Caspar David Friedrich was truly moved by the ruined abbey too. In fact, he was the one that brought the ruins to the attention of the public. Since the early days of his career, he became extremely interested in the ruins and they became a frequent subject of his paintings. 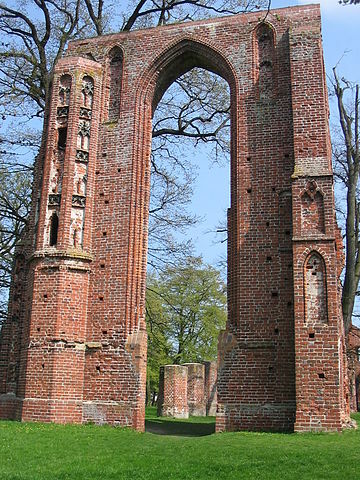 He was born on 5 September 1774 in Greifswald and during his visits to his native region, he spent hours observing and studying the ruined Eldena Abbey patiently and precisely, thus discovering more and more details and elements of its architecture and creating many drawings from different angles and perspectives. Now some of them can be seen in the “Eldena Room” at the Caspar David Friedrich Centre in Greifswald. 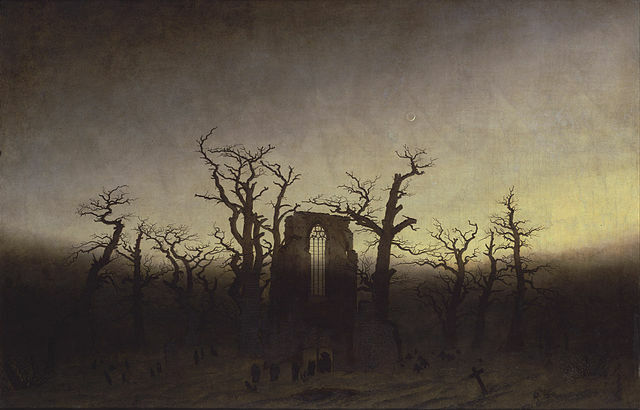 Many of his paintings are based on sketches of the abbey’s ruin. 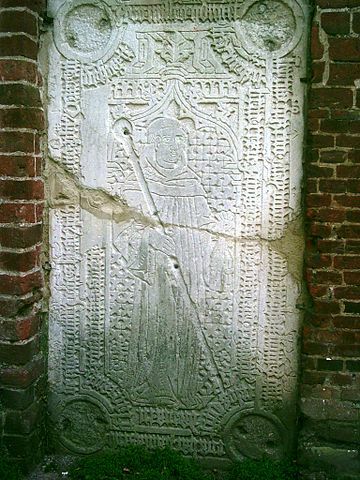 The story of the abbey begins more than 800 years ago. Cistercian monks settled at the site of the today’s ruins and founded a monastery in 1199. Originally it was known as Hilda Abbey, after the name of the village at the time. 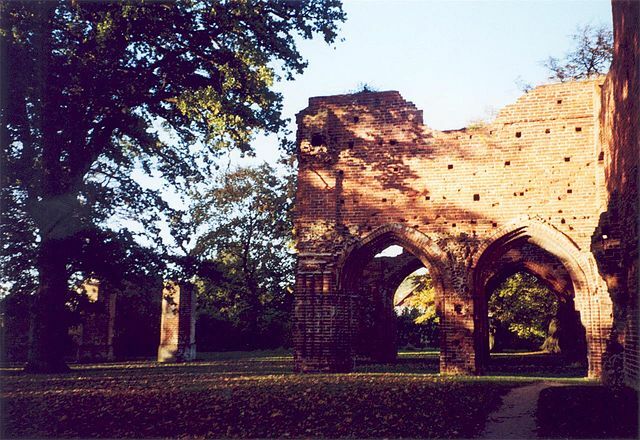 Throughout the years the abbey played a significant role in the formation of German, Wendish and Danish settlements and in the cultivation of the close area. But unfortunately, it was dissolved in the days when the Reformation was introduced into Pomerania. The successful monastic life of the abbey officially ended in 1535. 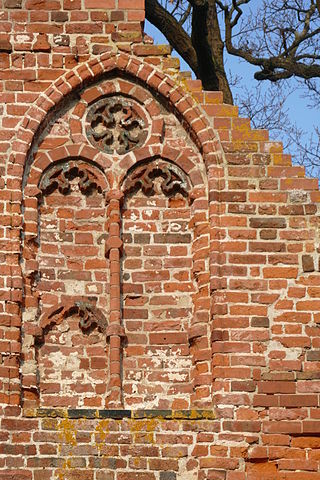 The abbey’s buildings were seriously damaged during the Thirty Year’s War and then increasingly fell into ruin. 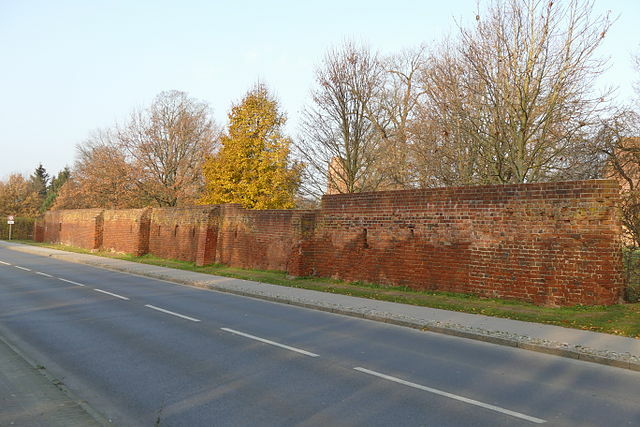 In the 17th and 18th century the bricks were often quarried away and used for the construction or repairing of various buildings, such as fortifications and university buildings. Nevertheless, the former abbey is a precious monument of medieval architecture and history, and there is still much to be seen. The parts that survive the passage of time and the turbulent events are more than enough evidence of the ingenuity of the Cistercian monks. Even in the smallest details can be recognized their highly developed sense of design and form. At the beginning of the 19th century, the remaining parts of the complex were to be removed, but the drawings and paintings made by Caspar David Friedrich drew people’s attention to the poor condition of the former abbey. In 1828 the ruins were systematically cleaned from the lush vegetation and preserved. From 1828 to 1832, the abbey’s grounds were developed into a park on the basis of designs of the Prussian landscape gardener Peter Joseph Lenné (1789 – 1866). The park is open for public visitors and free of charge. Even today, the abbey’s spectacular west facade, which became famed by Friedrich’s paintings, remains the main attraction of the site. It is worth to be noted that the painter was especially interested in the high western facade and it became the nucleus of many of his works. The park today also features an open-air stage. 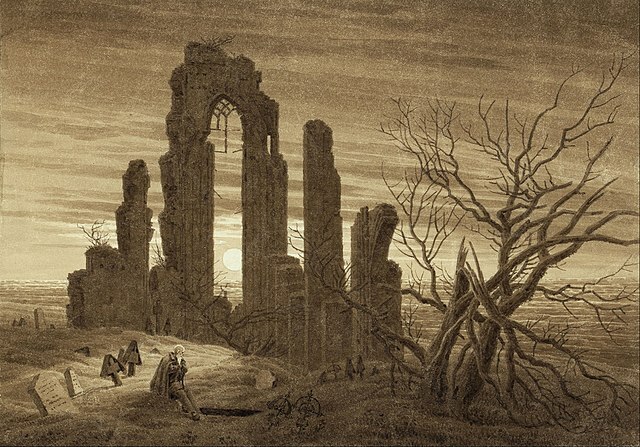 The ruins were not only Friedrich’s favourite subject, but they also represented a symbol of the painter’s beloved homeland. He is regarded as the most significant painter of the early German Romantic era and his paintings, especially those with the ruined Eldena Abbey, represent a manifestation of his inner world. He set the ruins in different locations, landscapes, scenes and atmosphere, probably according to his mood during the creation of the painting. 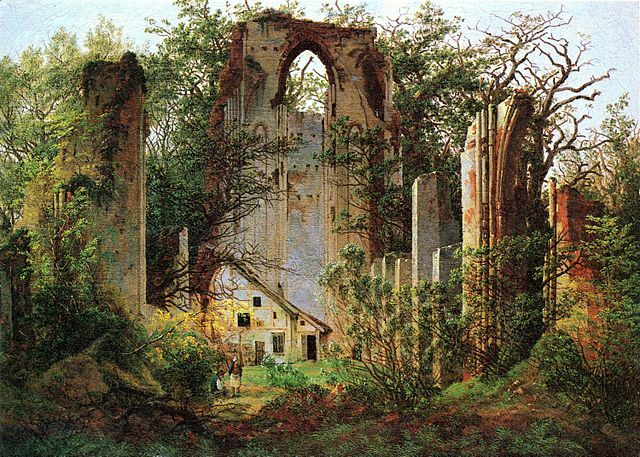 In Ruined Monastery of Eldena near Greifswald (1824/1825, Alte Nationalgalerie, Staatliche Museen zu Berlin), the ruins are illuminated in bright sunlight and overgrown by vegetation. 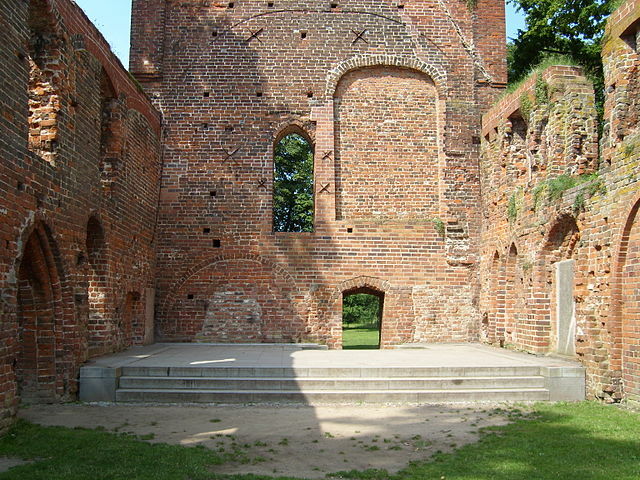 In Ruin of Eldena in the Giant Mountains (1830/1834, Pomeranian State Museum, Greifswald), the ruins appear in a completely different landscape. In the remarkable Abtei im Eichwald (Abbey among Oak Trees) (1809/1810 in Dresden, Alte Nationalgalerie, Staatliche Museen zu Berlin), probably Friedrich’s most famous painting of the ruins of Eldena Abbey, the ruins are placed in a desolate, melancholic atmosphere. In these paintings the painter with his own visual language wanted to tell an eternal message: Nature is permanent and man-made architecture is temporary. But his paintings can be interpreted not only as a metaphor of transience but also as a tribute to the former glory of the Eldena Abbey too. 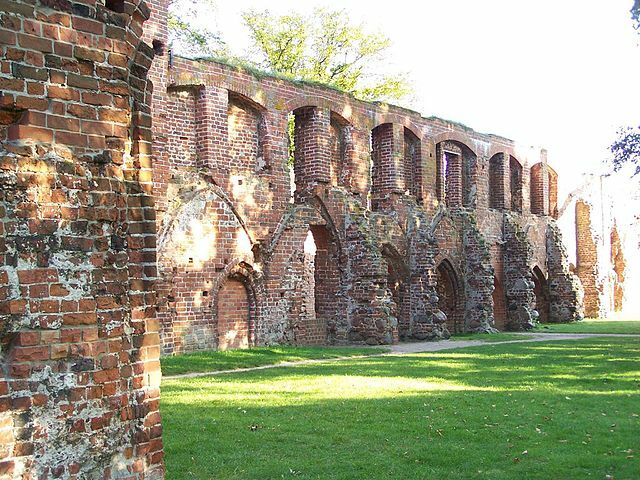 The ruins of Eldena Abbey and the surrounding park are a popular tourist destination of the citizens of Greifswald and the city’s visitors. The site is one of the stops on the Caspar David Friedrich Trail and the starting point of the themed cycle route “Northern German romantic period route”, where can be learned known and little-known facts of the lives of the Northern German romantics of Western Pomerania.